Frida Kahlo loved food, elaborate skirts and Diego Rivera. But the iconic Mexican painter was haunted by death every day of her life. Mexican novelist F. G. Haghenbeck uncovers her inner life in the novel The Secret Book of Frida Kahlo (Atria). The “secret book” refers to one of the journals found in La Casa Azul, her home in Mexico, and Haghenbeck imagines its content. 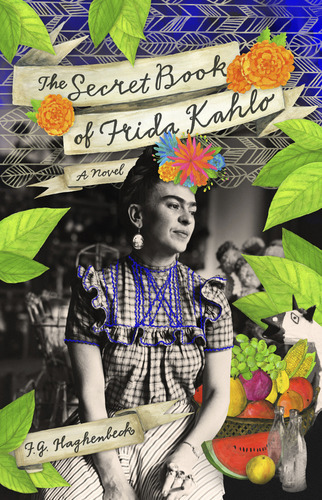 Each chapter depicts a phase in her life – her childhood, her love affair with Mexican painter Diego Rivera, meetings with Ernest Hemingway and other writers in Paris – and ends with Kahlo’s thoughts and recipes. Food plays a big role in reflecting her moods. When she lives in San Francisco and Detroit, she calls the food bland – just like the sad times she had there compared to the spicy flavors and life in her homeland. When Diego’s wife Lupe confronts her after their affair, it’s in the kitchen. As Lupe tells her, “A woman should know how to move in the kitchen so her man won’t want to eat anywhere else.” The chapter ends up becoming one of the most amusing in the book. But the major motif of the book is death. Kahlo nearly died in a bus accident, and she made a deal with Death to sacrifice one thing each year she lives – compromises that include the loss of a child and Rivera’s constant infidelity. My only complaint: some chapters are stronger than others. But, overall, it’s a intriguing look into the mind of one of the most legendary figures in the Latino community. F. G. Haghenbeck, who was born and lives in Mexico, is known for his crime novels, such as the award-winning Trago amargo (Bitter Drink). 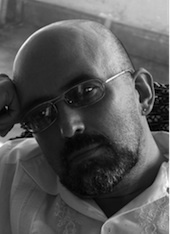 He also has written for Superman and other graphic novels. Source: I received a review copy from the publisher. I have this checked out but haven’t gotten to read it yet. Now I’m even more excited to! Thanks for sharing.